The treatment of metal surfaces is varied and complex and is subject to many of the same environmental, usage, and maintenance issues as described for the paint and decorated surfaces. Metal surfaces have been decorated in manners ranging from ornate and complex to plain and simple. Their care and treatment is subject to a wide range of considerations. Schuettinger Conservation strives to preserve all of the original materials allowing for incoating, inpainting for visual integration. A series of images depicting the treatments of a group of 16 decorated cast iron and wood upholstered benches from a larger group original designed by Constantino Brumidi for use in the U.S. House Chamber in 1859 and which are now used on a daily basis in the U.S Capitol Rotunda. In the year 2000 Schuettinger Conservation conducted a study of the remaining 16 benches concluding that there was evidence of the original presentation surface on several of the benches and that historical information relating to the individuals and materials used to create the benches was discovered. 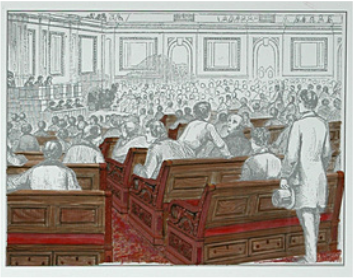 An example of one of the benches before treatment (above) and an example of one of the benches after treatment in the Rotunda of the United States Capitol (below). The application of the specialized Mica decorative pigment formulations was used to match the original evidence. 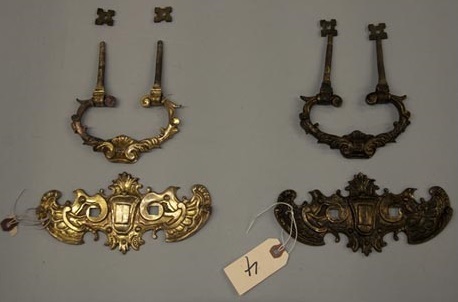 Below: Images show a detailed image of the original American Interpretation of a "Florentine Bronze" decorated on cast iron uncovered beneath 22 layers of paint and other coatings. 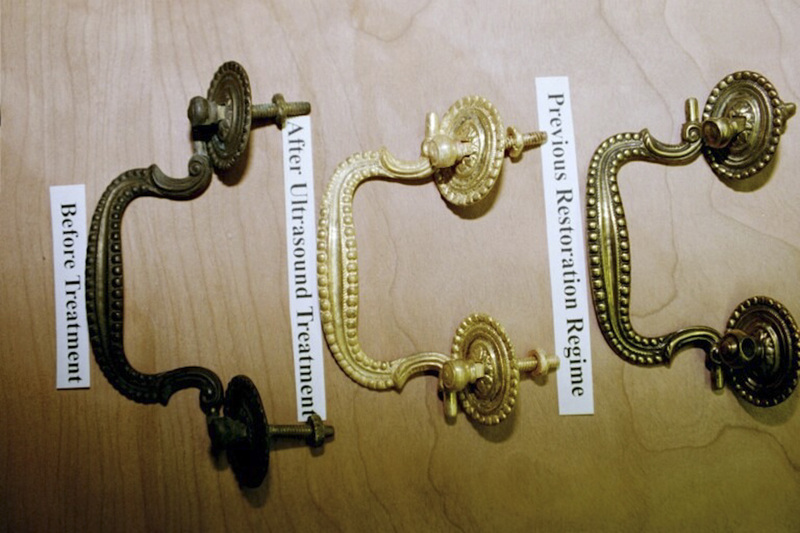 Below: Gold plated baroque style drawer pulls and handles that were restored using ultrasound treatment.